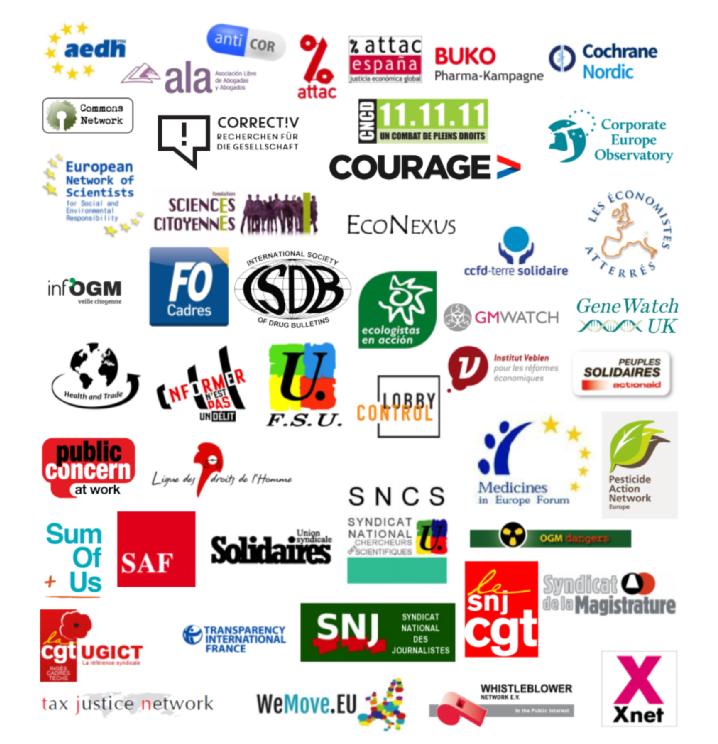 On behalf of more than 46 civil society organisations in Europe representing journalists, judges, whistle-blowers, scientists, unions, associations… I am writing to you to ask you to consider rejecting the current draft text of the Trade Secrets Protection Directive when you will vote it in Strasbourg next Thursday 14 April. Industrial espionage and trade secrets theft is a real problem, but we consider that this text abuses its purpose by applying to the whole of society legal remedies that should only apply to economic entities (competitors). Moreover, the text foresees a definition of trade secrets which is so broad that it could include almost any internal information. Therefore, it offers private companies a right to sue anyone who would acquire, use or publish any information or document they consider a trade secret even if this person has no economic intention or motives. The consequence would be that judges would have to balance crucial political rights and considerations, such as employees’ mobility and innovation, press freedoms and the right and need to access and publish certain proprietary information in the public interest (whistle-blowers but also scientists willing to test the safety of products on the market)… with the economic interests of trade secret owners. This is not needed to fight industrial espionage. This vote is all the more important that this text will become part of the TTIP if signed. Please find enclosed a detailed factsheet on the directive which details our concerns and explains our position. We remain at your entire disposal should you need any additional information. Trade secrets are everything companies keep secret to stay ahead of competitors. A secret recipe or manufacturing process, plans of a new product, a list of clients, prototypes… The theft of trade secrets can be a real problem for companies, and is already punished in all EU Member States. But there was no uniform legislation on the matter at the EU level. The European Parliament is expected to vote on 14 April 2016 on the “Directive on the protection of undisclosed know-how and business information (trade secrets) against their unlawful acquisition, use and disclosure”. The text can no longer be changed. The directive initially drafted by the European Commission favored companies’ economic rights at the expense of citizens’ political rights. Unfortunately, despite some improvements, the compromise text still does the same. We think it is essential that MEPs reject it and ask the Commission to come up with a better one, but they are under heavy pressure from multinational corporations to adopt it. With the very broad and vague definition1 used in this draft directive, almost all internal information within a company can be considered a trade secret. With this text, companies do not need to pro-actively identify which information they consider a trade secret, as states do when they put “top secret” or “confidential” labels on documents. But employees, journalists, consumers… sometimes also need to have access to, use and publish such information without the company’s consent, and would now face legal threats and heavy fines for doing so. The exceptions foreseen in the text do not correctly protect them, and the huge legal uncertainties created by this text will have a chilling effect that will prevent people in possession of information revealing corporate misconduct or wrongdoing from reporting it. An additional problem is that the Directive foresees precautionary measures to prohibit the disclosure of documents and proofs during legal procedures, hiding them from public sight. While it is true that certain companies sue others for the sole purpose of accessing their trade secrets and that this is a problem, why should such measures, which risk undermining the rights of defence, apply to individuals? Last but not least, this Directive only sets a minimum standard in the EU: Member States will be able to go further when they transpose the text in national law, and will be lobbied by industry all over Europe to do so. This will create a situation of uneven legislations in the EU that companies will be able to use, launching lawsuits from the country with the most aggressive measures for trade secrets protection. The European Commission keeps talking about the need to prevent legal discrepancies in the EU (its “Better Regulation” initiative), but has not voiced similar concerns as far as this text was concerned. In January 2015, when the French government tried to adopt in anticipation the key elements of the directive, it added criminal measures of three years in jail and a 375,000€ fine for trade secrets violation (and twice as much when vague “national interests” would be at stake). French journalists mobilised to protect their freedom to report on companies’ misbehaviour, and managed to convince the government to withdraw the project; but comparable measures will be considered again in all EU Member States if the Directive is adopted. How safe are products used every day by European consumers? Only independent scientific scrutiny can tell. The scientific studies evaluating the risks of most products in Europe are done by their producers, who then send them to public regulators for assessment. These then take the decision to grant or not a market authorisation. The problem is that producers systematically oppose the publication of these studies as they consider that they contain trade secrets and, because they are costly, should not be seen and used by competitors. A recent example took place in Rennes, France, where a man died during a clinical trial. Scientists are now asking to access the data of this clinical trial to find out what happened, but the company, Biotrial, refuses, claiming that it needs to protect its trade secrets. Another recent example is glyphosate, the active substance in Monsanto’s Roundup wide-spectrum herbicide: industry-sponsored scientific studies at the basis of the EU’s controversial assessment that it is “unlikely” to cause cancer to humans (the WHO found the opposite 6 months earlier) cannot be published and studied by independent scientists to make the debate progress because their owners consider they are (and contain) trade secrets. Scientists and civil society groups have been fighting for a very long time to obtain the publication of these studies so that the assessment of products put today on the EU market can be properly… scientific, and significant gains have been obtained for medicines, with the publication of clinical trials data foreseen in the coming years in the EU. But this is still a difficult battle, and with the high financial penalties foreseen in the text for trade secrets disclosure without their owners’ consent, companies will be given an additional argument to threaten public authorities if these would want to publish these studies. Journalists will be directly impacted by the Directive. References to the right to information as defined in the EU Charter of Fundamental Rights are made in the text, but the Charter applies regardless of it being mentioned so this does not make a difference: companies will be given the right to sue anyone publishing information they consider a trade secret, and the judge will have to balance this economic right with journalists’ political right to inform. While there is language in the text that says the right of information should not be harmed by this directive, there is no guarantee that it will actually be given preference, and journalists will have to weigh up the risk, taking into account potential very high financial damages. Legal harassment of media by private companies and wealthy individuals using defamation laws is already widespread, they will now be able to use trade secrets protection as an additional argument pending case law protects the media – if is does! Which media editor will take the risk of financial ruin in the meantime? These are (most of the time) employees willing to reveal actions or plans of their employers that they think harm the public interest. They are often the main source of information of the media or public authorities on corporate misbehaviour, and this has been a very thorny issue in the negotiations since the Commission’s proposal. But even now, whistleblowers are only protected when they act “for the purpose of protecting the public general interest” (Article 5) and when they reveal a “misconduct, wrongdoing or illegal activity”: this restrictive list leaves large gaps. They (and journalists using their information) will need to demonstrate to the judge that they acted with “the purpose of protecting the public general interest”: the burden of the proof is on them, and while large companies can afford long and expensive legal procedures, individuals usually cannot. For instance, the documents which caused the Luxleaks scandal were contracts between Luxembourg and multinational companies, and, from the point of view of Luxembourg, legitimate since most EU countries are also engaged in such dealings to attract multinationals. As a consequence, the whistleblower and the journalist, who are being prosecuted in Luxembourg for (among other things) trade secrets violations, would not be protected by the Directive even though they revealed a major tax evasion scandal harming all European tax payers who contribute their fair share to public budgets. Aren’t all of them protected by specific exceptions in the text? In our analysis, the real exceptions in the text (Article 5) are insufficient and the other exceptions (in the Recitals but also especially in Article 1) are political indications that Member States will have the possibility to ignore when adapting the directive in national law. The original proposal by the Commission was very bad and, after we and many others managed to create some public debate about it, MEPs and some Member States added to and improved these exceptions, notably for whistleblowers, journalists and employees. But now the text cannot be changed any more and, as we explain above, we think it is still very far from a correct compromise between the need to protect companies’ trade secrets and the need to defend the integrity of citizens’ political rights. One must absolutely keep in mind, while discussing this text, that it uses such sweeping definitions for “trade secrets” that it creates numerous legal uncertainties. It will take a lot of time for these uncertainties to be clarified by judges, and there is no guarantee that these will always give priority to political rights against economic interests in their judgements. Furthermore, if the legal definitions are vague, the financial penalties foreseen are potentially significant, and this situation of legal uncertainty and high financial penalties will enable companies to use the “trade secrets protection” argument extensively in their litigations against whoever they think can be attacked with it, even if there is luckily language in the text now repressing manifest litigation abuses. Again, while trade secrets protection is a legitimate objective, this Directive goes way too far and should be rewritten, and this time with a public debate at the beginning of the process, not at the end. Asking companies to pro-actively identify their trade secrets and using specific unfair competition terminology (restricting the scope to economic operators) as opposed to catch-all intellectual property language, for instance, would do a much better job at enabling companies to meaningfully protect their trade secrets without endangering everyone else’s rights. Isn’t trade secrets protection good for innovation? It depends. Trade secrets protection is good for individual companies who want to defend a competitive advantage and can be temporarily necessary to enable them to recoup their investments; but prolonged secrecy is also a way to defend harmful monopoly positions. Overall innovation in society thrives on sharing ideas and processes, not keeping them secret. A journalist who wrote about this Directive commented that “the directive is overall a victory for multinationals panicking about competition”. 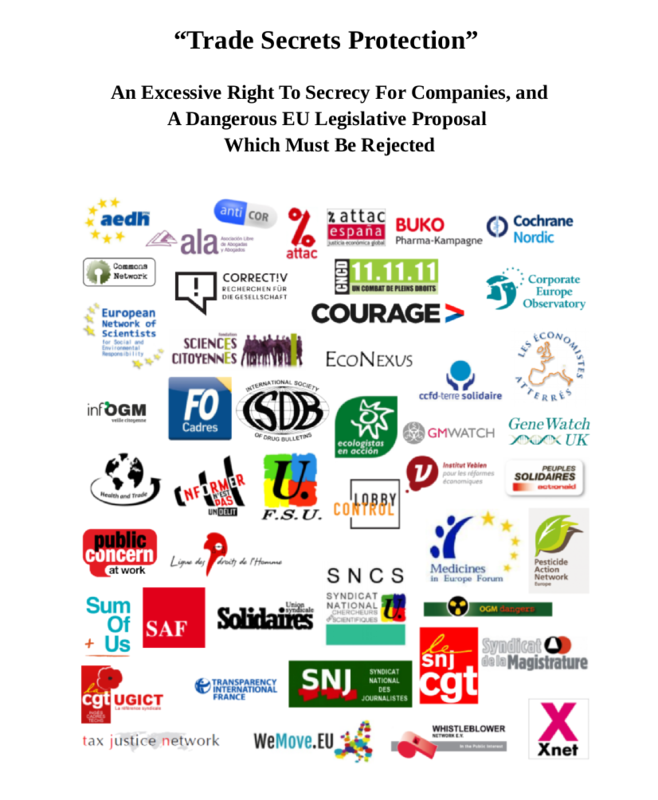 Is there a link between trade secrets protection and the TTIP negotiations? Yes and no. Formally this Directive and the TTIP negotiations are two separate processes. However, it is striking to see that almost exactly the same text is going through Congress as we write and that this will lead to a de facto harmonisation of the legislation on trade secrets protection in the EU and in the US. The regulatory cooperation mechanism foreseen in the TTIP will make changing this legislation very difficult if the TTIP agreement is adopted. This makes rejecting this bad text all the more important. ← Project Solid – can the web be re-decentralised?